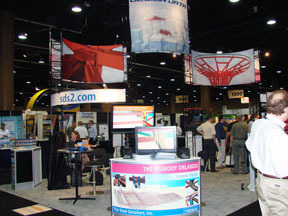 The 2010 NASCC Conference — which was held in conjunction with The Structures Congress May 12 - 15 in Orlando, Florida — boasted near-record attendance numbers, as structural engineers, detailers, erectors and fabricators convened from around the world to learn about the latest advancements in the steel industry. In the SDS/2 booth, conference attendees got a glimpse at the future of the software. In-booth demonstrations included first looks at the caged ladder custom member, SidePlate® connections, importing joist manufacturer files, joist custom member, custom toolbar icons, drawing reference in Modeling, and enhanced point location in Modeling. The booth also highlighted customer projects in the Orlando area — such as The Peabody Orlando (The Steel Detailers, Inc.); Expedition Everest (WBF Detailing); and Orlando International Airport, Airside 1 (Spencer Reed Group and Met-Con, Inc.) —via a video display and custom signage. Demos at the EAD/2 booth showed strides made in the software since last year's NASCC conference, most notably the inclusion of seismic design. The booth received a steady flow of traffic from both engineers and engineering instructors, as well as SDS/2 customers and other detailers. More than 750 attendees joined Peddinghaus at its annual customer appreciation event. The festivities kicked off with a marching band, which paraded around the show floor. Anton Peddinghaus led the parade, which also included Design Data staff. The networking event itself included entertainment by comedians Ron White and Todd Sawyer, and was highlighted by the drawing of Peddinghaus' custom-built motorcycle. 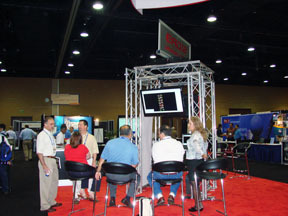 To view additional photos from the 2010 NASCC conference, click here. Be sure to join Design Data at the 2011 NASCC Conference, which will be held May 11-14, 2011 in Pittsburgh, Pennsylvania.